Hello! It's Jennifer on the blog today to share a little project I created with the new Bunny Mini DIY Pallet Shape! Easter is a little over three weeks away and I thought it would be fun to use the Bunny Mini Pallet as the perfect decoration on a bag of candy! I'm going to show you the techniques I used to color my pallet! First I applied a thin coat of white chalk paint to the front. I allowed some of the wood to show through for a distressed look. Once dry, I secured the new 4x6 Butterfly Flock Stencil over the top of my pallet. Using washi or painters tape does the trick to hold your stencil in place. I then selected three coordinating colors of Distress Oxide Inks to use and applied from dark to light from the bottom. Applying in a circular motion with a foam ink applicator works best and I did allow my colors to blend. Here is a close up of the end result! I love the bright spring colors! To secure my Bunny Mini Pallet to the clear bag, I used bakers twine from my stash. I also created a fun Easter tag to add as well. Thank you for stopping by the blog today! Check out the new 4x6 Stencils and Mini Pallet Shapes in the Clear Scraps shop! Have a great day! Additional products used: patterned paper, sticker: Simple Stories; stapler, inks: Ranger; bakers twine: Whisker Graphics; ribbon: Snug Hug; paint: Plaid; misc: clear bag, vellum. Hi everyone, Steph Ackerman here today with a banner using one of the new wood quotes - Love you More XL Script Wood Quote. Begin by removing the film from one side of the banner and then painting it with white acrylic paint. Allow to dry before removing the film from the opposite side, as the film protects the panel from paint leakage. Cut pattern paper to fit the reverse side and adhere. I wanted a hint of pattern paper to show and the paint provided a nice hazy effect. Using red ink, ink around the edges of the panel. Glue pom pom ribbon to the edge. Once dry, glue metallic trim on top. Spritz wood quote with Fireworks! Angel Pink Shimmery Craft Spray. Add additional color with Rocket Red ink pad around the edges. Assemble a fabric flower with a pretty brad and glue to the "O" in You. Adhere the quote with foam adhesives for dimension. Add 2 additional flowers to the banner with brads. Run ribbon through the holes to use as a hanger. Hello Clear Scraps fans! Today, I would like to share with you a layout using an XL Scallop piece by Clear Scraps. I've lightly highlighted the edges of the acrylic piece using Copic markers. I've used the Precious and stars mascils to create the background and the title. I've also used pieces of acrylic from the Baby Embellishment set to embellish this layout. To create some textures, I've run the acrylic star through the embossing folder. Clear Scraps & Pion Designs Day #4! Other Supplies Used: Stazon Inkpad, Beacon All purpose adhesive glue, MS butterfly punch. Pinky here! I have my second project for Clear Scraps and Pion Design using Pion-Paris Flea Market Borders paper and one of the amazing Clear Scraps Half Fancy Send It Clear Card! Hello friends! Jennifer here and I'm BEYOND excited to be back with the Clear Scraps team again! I dearly love this company as well as the people who run the show behind the scenes. Today, I'm happy to share a layout I created using a few of Clear Scraps' awesome products! I'm a big fan of chevrons so when the 12 inch Chevron Mascil was released, I was a happy scrapper! I used the Mascil along with a bright yellow spray ink and lightly misted in a few areas. You can go as light or dark with your mediums. And the great thing is that the Mascil stays in place so there is always a clean image after you are finished! I also used one of the Small Stars Clear Shape along with another fun Mascil: the 6 inch Polka Dots. Here, I first colored the star with Ranger Alcohol ink in Butterscotch. After drying (which is super quick! ), I applied modeling paste with the Mascil. Here are a few extra shots of my page! I love to do GIVEAWAYS and happened to have an extra 6 inch Mascil in my possession! Simply visit my blog Sunday March 8th! Thank you for stopping by today! Last Day for Imagine Crafts + Clear Scraps Fun! It's our last day of a week long blog showcase sharing Imagine Crafts and Clear Scraps and what amazing projects so far! Today is our last day and your last chance to enter to win, SUNDAY we will be sharing FIVE winners or a package from Clear Scraps, so be sure to LIKE, SHARE and COMMENT. Today we have Connie and her amazing scrapbook page- this is her second page- and we just love it!! Hi, Connie here with a project using the Forest Stencil by Clear Scraps and irRESISTible Texture Spray, in white, by Imagine Crafts. The texture that was added to the acrylic sheet was amazing, looked like snow! I used Beacon Zip Dry to adhere the acrylic sheet to the pattern paper The stenciled side is facing out. I wanted all of that great texture to show. The irRESISTible Texture Spray dried fast and I was happy with the results!! And comment on our FB page for a chance to win all week long! Fourth Day Of Imagine Crafts + Clear Scraps Fun! Day 6 Imagine Crafts + Clear Scraps! Day 5- Imagine Crafts + Clear Scraps!! Welcome to Day 6 of the Imagine Crafts and Clear Scraps blog feature! Today we have the amazing Nancy and her beautiful art!! Nancy used one of our 12x12 clear acrylic craft sheets and the 12" Quaterfoil Maskil to create her mixed media art work. She stamped her image onto the front of the sheet using the Jet Black StazOn and then colored the image from the back using a combination of Claret, Blue Hawaii, Orange Zest, Ganache, St. Valentine, and Emerald City StazOn inks. She applied the inks using a combination of Inkblushers and Fantastix. Once the inks had dried, Nancy used a combination of Silver and Bronze irRESISTibles with the stencil and splattered Wedding dress over the top. Finally embellishing with a few flowers, a butterfly and rub ons. Day One Imagine & Clear Scraps Blog Feature! On our 5th day of Clear Scraps and Imagine Crafts goodness we have Sue and Jennifer! First up is Sue with this tag she dressed up using Clear Scraps and StazOn. along with a variety of StazOn Inks for a wonderful effect. I love how the ink works so well with acrylic. And... that Wedding Dress irrRESISTible colored textured spray, LOVE!!! And of course Jennifer's project! As you can see Imagine Crafts StazOn inks work perfectly with Clear Scraps acrylics!!! It's day FOUR of our Imagine Crafts + Clear Scraps Blog features and today we have the incredible Connie and Pinky! Connie here with a project showing just how well these two products compliment each other, Clear Scraps and Imagine Crafts. I really think they were made for each other:). I have a scrapbooking page that I used black StazOn ink to color the acrylic Arrow Shape and the Film Strip Border by Clear Scraps. The paper is by Echo Park. The 6" Numbers Stencil is used in the background. The ink dried fast and covered the acrylic great. I turned the ink pad upside down and patted it on the acrylic pieces. No mess! Great look!!!! I have another project, using these two great products, on my blog, Crafty Goodies. And we also have the second part of Pinky's project up! Hey there it's Pinky again with the inside pages to the Clear Scraps Build It Your Way Binder Cover I created earlier this week with the faux wood look using irRESISTible sprays. If you check out my blog I have all of them up, these sprays are fantastic! Welcome to day 3 of the Clear Scraps + Imagine Crafts blog blast! Today we have LISA and KATIE and their beautful work. It's day two of our Imagine Crafts + Clear Scraps Blog features and today we have the amazing Pinky and Adora! First Pinky shares this great wood grain affect she creates on the Clear Scraps Build It Your Way Binder Cover (She will share the beautiful pages this week later!) if you go to her blog she shares more photos and just how she did it with the irRESISTible sprays! Hello everyone this is Adora and for my project using Imagine crafts-Irresistible Colored Texture Spray and Stazon Ink with our very own Clear Scraps Acrylics, I created this summer layout. This is such a fun and effective way to add color on all your acrylic projects. Coloring acrylics can be sometimes intimidating but these colored texture sprays work so well and easy to use. So stay tuned for more inspiration. Clear Scraps Supplies: Clear Scraps 12X12 Acrylic sheet, Acrylic Alphabets & Acrylic Circles Shapes Imagine Craft Supplies; Irresistible Colored Texture Spray (Copper, Wedding Dress and Tuxedo Black) Stazon Inkpad (Orange Zest, Blue Hawaii and Spiced Chai. Announcing The Clear Scraps 2013/2014 Design Team! Hello! This week we are featuring Imagine Crafts! Imagine Crafts has generously supplied the Clear Scraps team with several of their AMAZING products. Today we have Raechelle, and Wendy with their amazing talents! 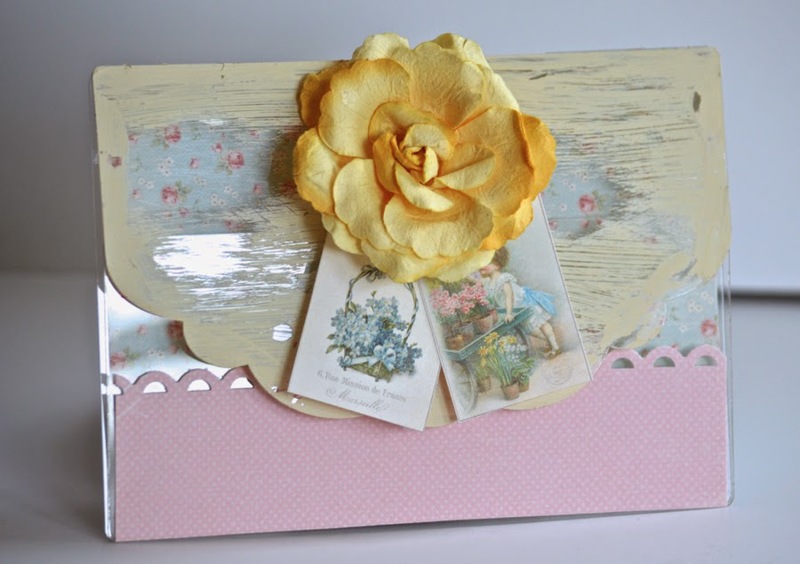 To create this card I used an Ornate Send it Clear Card from Clear Scraps as well as Cloudy Sky StazOn Midi as well as touches of the Copper irRESISTible Texture Spray from Imagine Crafts. To make this card, I first positioned the 12" Damask Mascil atop of the top two pieces of the Send it Clear Card. I rubbed/pushed the Cloudy Sky StazOn ink pad over the Mascil. The ink dries almost instantaniously so there is little worry about smudging or bleeding. Next sprayed a bit of the Copper irRESISTible Texture Spray onto a sheet of scrap paper. ThenI lightly dabbed a paint brush into it and then softly applied a thin coat over the stamped Damask image. It adds just a touch of shimmer which is a nice finishing touch. I also added the Cloudy Sky ink pad along all the edges to give it some extra dimension. Imagine Crafts has a wide variety of products to suit all of your crafting needs. Please take some time to take a look at what they have to offer by visiting the Imagine Crafts blog. Here is Wendy's gorgeous project! Clear Scrap and Imagine Crafts are teaming up for a great week of inspiration! Head on over to my blog, Paper Ink and Smiles for a tutorial on how to create this starry sky. I love using Clear Scrap and Imagine Crafts it will be a great week of inspiration! We have a great prize package for every day this week, so be sure to COMMENT, SHARE, LIKE and WIN! Head to our Facebook, or comment right here on the blog. Clear Scraps & DCVW WINNER! We had a wonderful week full of fun and inspiring projects from Clear Scraps AND DCVW. We appreciate everyone stopping by and commenting. Here is a glimpse of what happened all week. Great ideas from talented ladies of DCVW and CS- what a wonderful combo. Janis please email contest@clearscraps.com with your address! Clear Scraps & DCVW Day 4! Clear Scraps + DCVW Day 3! Giveaways and more! DCVW & Clear Scraps Plus GIVEAWAYS! DCVW + Clear Scraps Day TWO! Hello again friends and welcome to day 4 of the DCVW + Clear Scraps Blog filled with GIVEAWAYS and INSPIRATION!! We have today left for great inspiration and tomorrow a prize announcement. Clear Scraps has paired with DCVW to create some great project ideas for you, it really is the perfect combination of high quality acrylic products with amazing paper products to create so many great projects. All day Monday we have Clear Scraps designers. You can always go back to the first day and comment! Here are a couple of sneak peeks into the amazing creations up in the hop! BE SURE TO COMMENT EVERY DAY!! Hello again friends and welcome to day 3 of the DCVW + Clear Scraps Blog GIVEAWAYS and INSPIRATION!! We have today and tomorrow left for great inspiration! And of course the fantastic Connie Mercer! All day Sunday and Monday we have Clear Scraps designers! Here is a sneak peek of one of the amazing creations up in the hop! SEI & Beacon- Perfect For Fall Fun!